I remember when I got my first business trip to Bermuda, I was a little awestricken. It’s an awe-inspiring place. Looking out of the airplane window coming into land all one can see is ocean, and with the descent the swell of the water comes closer and closer, but then suddenly like an iceberg, is a narrow collection of islands. The colour of the iceberg though is British racing green. They lost my luggage that first time, some things don’t change, but the island made an impression on me during those couple of short days. Visiting somewhere and living there are two different things but when I saw my bosses brain whirring when we were talking about my career post-Chicago in late 2007 I was hoping he would throw Bermuda into the equation. We moved to Bermuda in July 2008 after five years in Chicago and we miss Chicago everyday, but fortunately it is impossible to compare the two. The tourism office has a phrase that ‘Bermuda is like no place on earth’ and that is true on so many levels! 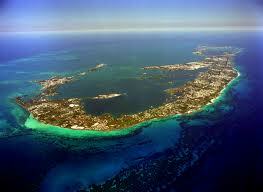 Bermuda fits into a cozy 20.6 square miles, and is only a mile wide at it’s widest point. It’s easy to forget, unless you spend a lot of time on the water that Bermuda is actually made up of 181 islands, most of which are uninhabited but 8 are connected by bridges and causeways. On land the island is divided into nine Parishes and two Municipalities, one being the capital Hamilton and the other historic St George’s, where Bermuda was first settled. Outside of these there are officially only two places big enough to be called Villages, Flatts and Somerset. There used to be a third but Tuckers Town, a forgotten community is now only home to a posh golf club, the island’s best hotel and new homes that probably rely on huge offshore banking bonuses. The Parish names are a fantastic reminder of Colonial history and each contain scents of what may have been 400 years ago. They are all named after Elizabethan aristrocats, merry gentlemen who were both wealthy and had a pursuit of overseas exploration. Rather precisely each Parish is exactly the same size at 2.3 square miles. Parishes were originally known as Tribes as the island was broken down into shares of ownership and ran like fiefdoms from back across the Atlantic Ocean. I often compare living in Bermuda to that of living in an English village in the 1970’s, certainly the Marks & Spencer (one of the few branded shops on the island) looks like it has been lifted from that era. Shops are shut Sunday’s, they shut for lunch and the ‘closed’ signs appear on doors at 5pm. Whilst the backdrop to the island is idyllic, stunning in fact, if you scratch the surface it is less perfect. Bermuda has many quirks and peculiarities and I catch myself often being critical of this remote island, one of the remotest on earth, but then when I’m sat on top of the ferry going home from work or walking along the pink tinted sands I realise that I’m living in a postcard. Very very interesting, when i get a chance i’ll drop you a proper line – I’m originally from Sidcup..Dad still lives in Welling…my Brother also escaped 7 years ago to Brisbane..miss him..but chat every couple of days – I have a 6 yr old Son in Whitley Bay i travel to see once a fortnight (motorways or the occasional flight – we’re 20 mins from Heathrow) ..just to be a little part of each others life – huh broke up with his Mum 6 years ago..now been together with new girl for 4 and a half years..live together. had it not been for my wee Son i’d have left for Australia too … You sound like you have a fabulous life, with a partner thats making you very happy. Are you ever worried about the Bermuda triangle?